Thanks goes to Jorge Castro and a recent post of his about Quicklists in Unity. After reading his post and seeing how easy it was to add new Quicklist entries, I decided to give it a go with Opera. As you can see, my efforts were successful, but there are many more list items you could add to customize Opera’s Quicklist to suit your needs. 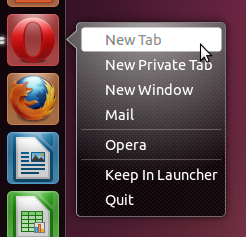 If you’re using Ubuntu 11.04 with Unity and want to customize this menu for yourself then just follow follow these simple steps. 3. Save and close the text editor. You may need to restart Unity or your computer before changes take effect. If you’d like to add more items to the Quicklist, simply add a shortcut name for it in “X-Ayatana-Desktop-Shortcuts" and create a "Shortcut Group" for it. 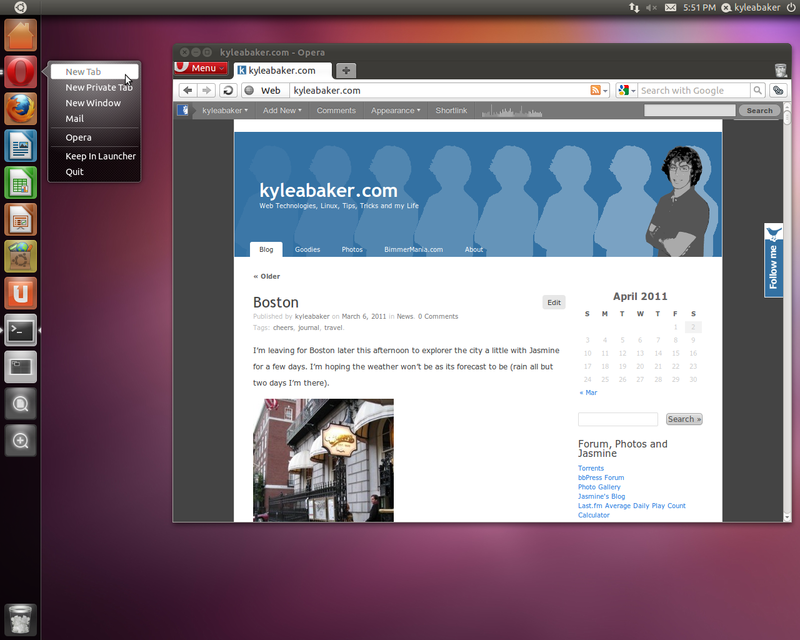 A couple of things that I considered adding were Gmail and Google Reader so that they simply open in new tabs. I’m sure you can find other useful shortcuts to add or maybe even more Opera command line options! If you don’t like the Quicklist items that you’ve added, all you need to do is open the opera-browser.desktop file and remove the lines that were added. Save, close and voila. Quicklists are great, but they would be more useful with Opera if we were able to select from a list of open or recent tabs. The new tab and window shortcuts that I’ve added are enough for me at the moment, but I would really love to see them added by default in the near future! Great to see someone doing work on programs who are not so cooperative by default (yet?). hello, ive got a problem, i do everything that is written here, but when i restart unity, there is no quick list in opera!!!!! !…..how can i fix this error????? Have you tried my newer method? Next Next post: Unity Opera!